Susie Sumner Revels, a daughter of Hiram Revels, the first U.S. Senator of African descent, arrived in Seattle, Washington from Mississippi in 1896. Her reason, she stated, during a 1936 Washington Pioneers Project interview, was “the man she was going to marry was here.” He was Horace Roscoe Cayton, publisher of The Seattle Republican. The two were married on July 12, 1896. Susie Revels Cayton soon became a leader in Seattle’s black community. She was named associate editor of The Seattle Republican and, later, contributing editor of Cayton’s Weekly. 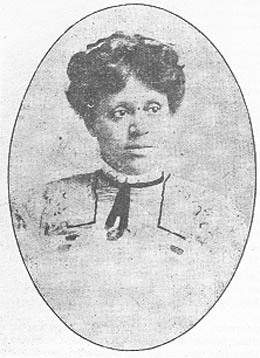 She was an active member of cultural and social organizations designed to improve the conditions of African Americans, including the “Sunday Forum,” a group of black Seattleites that met on a regular basis. Along with three other black women, Susie Cayton founded the Dorcus Charity Club in response to an urgent plea to help a set of abandoned twins. The club continued its charitable work for years. Even with her family, newspaper and civic responsibilities, Susie Cayton managed to write short stories. Many appeared in The Seattle Republican and Cayton’s Weekly, and at least one, “Sally the Egg-Woman,” appeared in the Seattle Post-Intelligencer (June 3, 1900). Horace Cayton wrote, in 1917 “. . .[S]he is a splendid short story writer and were she able to devote her time and talent to . . . writing, she would soon rank among the best short story writers in the country.” Shortly after her husband’s death in 1940, Susie Cayton moved to Chicago where she died in 1943. Ed Diaz, ed., Horace Roscoe Cayton: Selected Writings- Volumes 1-2. (Seattle: Bridgewater-Collins, 2002); Quintard Taylor, The Forging of a Black Community: Seattle’s Central District from 1870 through the Civil Rights Era (Seattle: University of Washington Press, 1994).